Chronicles is the last book of the Hebrew Bible, according to the ordering in the Talmud (Tractate Baba Batra 14b) and in most printings of the Bible. (In the Aleppo Codex, a very accurate 11th-century C.E. manuscript of the Hebrew Bible, the last book is Ezra-Nehemiah.) The division into I Chronicles and II Chronicles is first found in the Septuagint, the Greek translation of the Hebrew Bible done in the second or third century B.C.E. Read the Book of Chronicles in Hebrew and English on Sefaria. Chronicles is generally considered to have been written in the fifth century B.C.E., and is therefore one of the latest books of the Hebrew Bible. The author of Chronicles evidently had access to most of the earlier books of the Bible, including Samuel and Kings, from which the book draws much of its material. Chronicles retells the story of the Israelite/Jewish people, briefly summarizing the history until the reign of King David, and then focusing on the reigns of David, Solomon and the later kings of Judea. (It largely omits any mention of the kings of the Northern Kingdom of Israel.) But Chronicles does not simply retell the narrative of the Davidic kings. Chronicles has its own particular view of Israel’s history to tell, in which particular events and groups are highlighted, while other events are de-emphasized. One aspect of this phenomenon is the fact that Chronicles never mentions the Exodus from Egypt. One passage in particular — the story of Ephraim’s sons who were born in Canaan (I Chronicles 7:21) — suggests that the Chronicler does not think that all of the children of Israel were in Egypt. The period of the wandering in the desert and the giving of the Torah also do not figure prominently. Chronicles also does not focus on the Babylonian exile: All periods when the Israelites did not live in the land of Israel are de-emphasized. On the other hand, Chronicles very clearly emphasizes the two dynastic political institutions of Judea, the Davidic monarchy and the Temple. It highlights the covenant that God made with David, and describes David and his descendants as sitting “on the throne of the Lord” (I Chronicles 29:23). David and Solomon are idealized and the period of their reign is described in glorious terms. The story of Solomon’s succession highlights this idealization: David is described as announcing to all of Israel that God has chosen Solomon as David’s successor (I Chronicles 28:5). God has chosen Solomon not only as David’s successor, but also as the builder of the Temple. During this announcement, David is described as publicly giving Solomon the plans for the building of the Temple, including a detailed accounting of the amount of gold to be used in making the Temple’s vessels, “all this in writing from God upon me…” (I Chronicles 28:19). In particular, David and Solomon are held responsible for establishing the divisions of the priests and Levites who work in the Temple, as well as the order of songs to be sung, an order which later kings are charged to uphold (II Chronicles 29:25). This conception of David’s role in ordering the Temple finds parallels in Nehemiah’s description of the Temple (Nehemiah 12:24), which seems to be characteristic of the post-exilic period. Chronicles goes to great lengths to describe the genealogies of the Temple workers whom David appointed (I Chronicles chapters 15, 16, 23-27). Genealogies of the early Israelites are also described in detail, with I Chronicles chapters 1-9 being a summary of Israelite history until the time of King David; the summary consists almost entirely of genealogies. It seems that Chronicles’ focus on connection with the land, monarchy, Temple and genealogy reflects the concerns of society in the land of Israel during the Return to Zion period. In the attempt to re-establish itself after the wrenching and disorienting experience of the Babylonian exile, institutions that highlighted stability and permanence were uppermost in the minds of the Jewish community. Thus, the Chronicler describes the history of the most glorious period of Israel’s earlier history by emphasizing the aspects most of concern to the Jews of his time. An additional concept that is emphasized many more times in Chronicles than in the parallel passages in Samuel or Kings is the concept of Torah, the law. In II Chronicles 6:16, God is described as having promised David that his dynasty will endure if his descendants “follow God’s Torah.” This replaces the formulation “walk before God” in the parallel passage in I Kings 8:25. In this passage, as in many others, the concept of a set divine Torah is highlighted. This is also a concept that is central to the Jews of the Return to Zion period: the leaders of the Return, Ezra and Nehemiah, seek to ensure that all the returnees know God’s laws, as canonized in the Torah, and organize public readings of the Torah (Nehemiah chapter 8), In re-telling earlier Israelite history, the Chronicler emphasizes or reformulates concepts in such a way that they are more directly relevant to the Jews of his time. 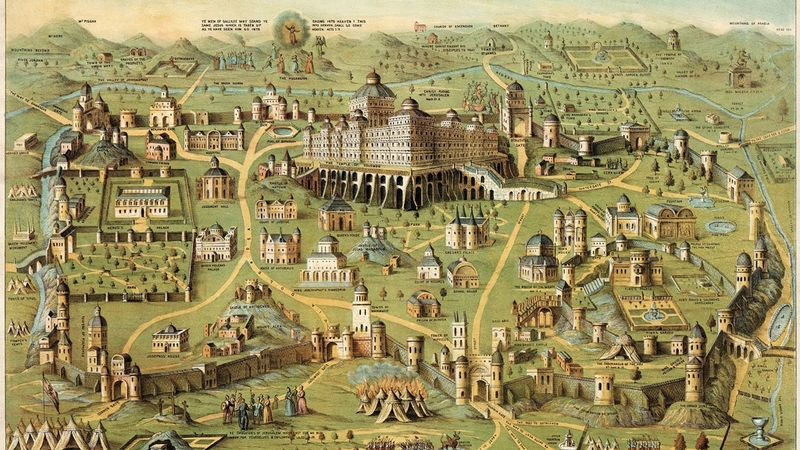 Religious reforms are thus the cause of Jerusalem’s salvation. This interpretation of political events is common in Chronicles: political success is the result of extirpating idolatry, obeying God’s Torah and His prophets, and honoring His Temple. We find similar interpretations in Chronicles’ narrative of the war of Rehoboam and Jeroboam in II Chronicles 13 and in its narrative of King Jehoshaphat’s war in II Chronicles 20. Chronicles also offers a new perspective on how religious and cultic acts are to be done, emphasizing the use of music in the Temple service (I Chronicles 15:19; II Chronicles 5:12, 29:25) and speaking of sacrifices being done “with joy” (II Chronicles 23:18; 30:21).